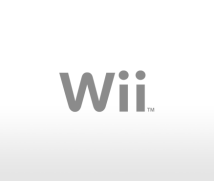 Miyamoto-san, how did you feel when you became fully involved in the development process? That's a difficult one. I hope it's okay to speak frankly? Well, I've been involved in developing several prototypes throughout the course of the project, so there weren't any serious problems, but... Firstly, the leaders hadn't been checking the progress of the staff. Many staff members weren't able to carry out their basic tasks. They weren't able to play catch ball yet; in fact, they hadn't even got the gist, such as catching the ball in the middle of the glove... Sloppy work, you might say. That's why I've mostly been helping by putting people back on track one by one, showing them how to go from working sloppily to being more careful. There's one thing I've been grateful for, and that is the level of motivation these people have. The cause of the sloppiness wasn't due to people's lack of motivation, but more that they were stuck in a rut due to the huge amount of work they had. I see. You could say they didn't know where to direct their focus? Yes, that's it. Because they were already highly motivated, by simply pointing out what task they should be doing they were able to make significant progress. And so we've managed to finish in around four months what would have taken around half a year. I was a little concerned at first, but the level of motivation within the development team has really helped. When you have a lot of individual issues to deal with, it becomes difficult to visualise the whole picture. That's when Miyamoto-san comes in with a clear idea of how things should be, and points us in a certain direction. Then, whether we fully understand what he's doing or not, we become able to move forward. When we do this, we catch a glimpse of the bigger picture. We feel a very real sense that if we are just able to continue like this, we'll get to the end of the project. The problem is that before we reach that point, there are far too many choices to be made, and things become easily confused while we are trying out various ideas. Everyone was feeling rather anxious and knew this situation wasn't good, so the main staff members got together to try to sort it out. Although there were some good results, there were some negative ones too. For instance, people lost their sense of individual responsibility. There were a huge amount of decisions which they said had "been made by all of them" and that therefore shouldn't be changed. My answer to this was: "You couldn't all have decided, somebody must've made the decision! Who was it?" When I asked why something wasn't completed, I was often told that it was being adjusted. I would say "the adjustments should've been done by now. Shouldn't you start by saying sorry?" (laughs) I suppose in that sense, I have been a little on the strict side. You have to start by getting people to take responsibility and be able to say: "It isn't done yet, I'm sorry. I take the responsibility." I just think that if we could all understand this, we could work together on solving the problems. Once we fix them, it's finished. It's as simple as that and then we can all relax. Then when we give it to focus testing groups we get a more positive response. They have said that the changes you instigated really improved the game. Once we've got all of that straightened out, the rest of the project becomes a process of simply making one small change after the other, carefully editing sound effects or fine-tuning things. Some refer to it as "Miyamoto Magic", but as far as you're concerned, you're just carefully working through everything that obviously needs to be done. Exactly, there is no other way. One other thing that I've noticed is that the younger members of staff, who've yet to work on that many projects, don't have a very clear idea of what it takes to bring a project to completion. With video games, the people who truly bring a project to completion are the senior staff such as the director, not the entire team. Those people involved in the project just seem to rush towards the end and cross the finish line without having a clear idea of what's happening. With time, those people develop a clearer idea of what is required to finish off a game properly. I think the company has gained a significant amount through the development of Zelda, as the number of staff we have with these skills has grown. Yes, we've learned a great deal about the process of completing a project. I believe there is a certain way to finish a project, just like there's a way to win in sport. Like getting used to completing them? Bringing something to completion becomes really fun. Before you reach the final stage, you can get obsessive and feel like you've got to add more and more. This desire to expand the game is overwhelming, so you find yourself unable to grasp that sense of achievement that you get from completing a project. It's just that, until you've reached that point it's vital that you are being pointed in the right direction for making the transition from a state of disorder to being able to experience that thrill of completing something. This is what sets the quality of the work apart, and where Miyamoto-san shows such focus. Quite frankly, I still can't see things that clearly. He'll say to me: "How many times have we been through this? And you still get confused?!" But, yes, I still lack that certain clarity. And because I still suffer with this, so in turn do my staff. That's one of the major reasons why we couldn't see the final destination clearly. Well, actually, I lose focus too you know. But when it happens, I just try to tell myself to get back on track and move forward. It still happens though. That's right. It's okay to be uncertain from time to time. But by making a decision and sticking to it, you can keep moving forward. But worrying about something so much that you end up waving the white flag is never good! Miyamoto-san, how do you feel about this? I've really enjoyed this project. I'm not saying I've been able to focus on it without sleep, or that I've got limitless supplies of stamina, but it was a lot of fun! Don't rub it in, by the end I was almost at the stage where I wanted to pull my hair out! When I really couldn't get my point across, I'd send e-mails explaining precisely what the game characters should be saying to each other. To which the person in charge of creating the game dialogue would sarcastically reply: "Okay then, we'll use that in the game just as it is. I guess I'm out of a job!" (laughs) Of course, I only used this approach with the staff I've known for a long time and who can fully appreciate where I'm coming from. I'm sure they would! (laughs) But I've heard that when this happens, the core staff have realised what's going on and let the newcomers know what to expect. Now, I'm not saying this to flatter my staff, but even though they were getting these harsh e-mails, we certainly didn't have anyone on the verge of giving up completely. Everybody worked hard right until the end. They certainly did, and that's what really helped us through. That's true. When Miyamoto-san said something harsh, we'd all try our best to respond with something that he wouldn't be able to complain about. We did this right to the end of the project. I know it's not pleasant for people to face criticism. We become light-headed, weak-kneed and often get angry. It's a normal response to rejection. Whether we're able to fend off this attack depends entirely on our training. But I think that young people today have never really had to face this before. They are all very high-achievers here. They're the best of the best, graduating from universities and being able to enter Nintendo, so they've never really faced this kind of harsh criticism before. But making products to sell to people is harsh. If we rush out something that's very rough around the edges, the complaints will soon come rolling in. So you could say that the criticism I give helps to prepare people for this, like a kind of warm-up before the main event. Even us older members can feel somewhat confused when we're suddenly told something we don't want to hear, as if our senses have been dulled. And when that happens, what do you do? It's all about how you fend off the attack. It's like getting rid of stress using Tanden1 breathing techniques... (laughs) Take three deep breaths, meditate on what you must do... Wow, I'm beginning to sound more and more like an old man! (laughs) 1 The Tanden is considered to be the centre of the body's gravity in disciplines such as martial arts and Buddhist meditation. Buddhist teachers often instruct their students to focus on it in order to control their thoughts and emotions. I think it's also a kind of training. If you can't enjoy what you're doing, you may as well give up. Anyway, what was it we were talking about again? Let me see, I was…..? Ah yes, we were discussing what I did after joining the project. Well, to put it in a nutshell, I felt that for the first time in a long while I was close to the position of the player. From this perspective I focused on putting all the disjointed components back in order. I jotted down the sections which didn't fit the overall story, or elements I thought were completely out of place. One of the aspects I concentrated on was checking things that shattered the sense of reality within the game. Is there any particularly memorable guidance Miyamoto-san gave you? Let me think. 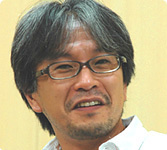 In one of his e-mails, Miyamoto-san wrote: "We're supposed to be creating something for people's entertainment. This part won't do at all." That has really stuck in my mind. He went on to say: "We want people to enjoy the game, but how on earth are they going to enjoy what you've done here?" The fact that we're making something to entertain people is completely obvious when you stop to think about it, but what he said made me realise it afresh. But the more the project deadlines started to close in, the easier it was for the development team to lose sight of that fact. And so, things that weren't going according to plan began to pile up? Exactly. If we just rushed something out without making it absolutely perfect, it would be convenient for us, but this idea of convenience doesn't really concern the customer. Their only concern is how it will entertain them, which I can appreciate. This time in particular, due to the lengthy development time of this project, we haven't always had the time to give this our undivided attention. At these times, Miyamoto-san has taken charge and looked at things purely from the perspective of how to produce high-quality entertainment. In my case, I've often felt that while I know what he's saying, it just wasn't always possible! (laughs) I felt like that a lot of the time, but whatever the situation when something important has to be done, even with strict time constraints, you just have to hold on tight and get the job done. There are always any number of things in the development area that you know could be improved, but that aren't easy to change right away. The staff have brought this up in previous interviews but when Miyamoto-san suggests a change to something they felt was already too late to change, they would realise that something had to be fixed and would find themselves able to get it done. There's that kind of gratitude towards Miyamoto-san. Ah, yes. (laughs) It happened a lot in the past with things that I thought I couldn't be changed, but when I said that Miyamoto-san wants it done, they seemed to get done. 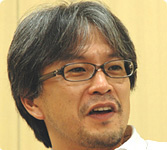 (laughs) But it wasn't like that this time, because Miyamoto-san gave us his suggestions in person. And for those that didn't quite get it, old hands like us would explain in a rather cryptic way that: "These changes will definitely improve the game, just like they always have in the past!" I think I do explain things clearly though. And I always try to be honest right from the word go. No, what I mean is that it's one thing to get someone to understand the reasons for something, but it's a totally different thing to get them to understand those reasons well enough to be able to explain them to somebody else. As we were reaching the end of the development cycle, I'd often suggest something and get an answer like "we already tried that and it didn't work". I'd then reply with: "Well, that was then and this is now. So let's try again!" This happened on many occasions. Yes, that kind of exchange was quite common. But hey, it's been a long project, initial builds differed quite considerably from the more up-to-date versions. He won't quit till he gets an answer! People say that you make it so a person can't escape, and then hit them where it really counts! You like delivering that killer blow, don't you? I suppose I do, yes! It threw the developers in charge into a real panic. They were saying things like: "Putting this move in the game right from the start means we've got a lot of work to do!" At times like that, I help out with all the things that have to be reworked to minimise the damage, don't I? I work really hard, you know! I suggest that if we change certain things, it will cause less damage. I only propose something once I have planned how it would actually be done. And once you've come up with your proposal, there's nothing we can say, right? (laughs) We no longer have a choice! It's a great job, isn't it?